The University of Aberdeen, Scotland, United Kingdom and the Marshall University, United States of America are seeking collaboration and linkage opportunities with the University. 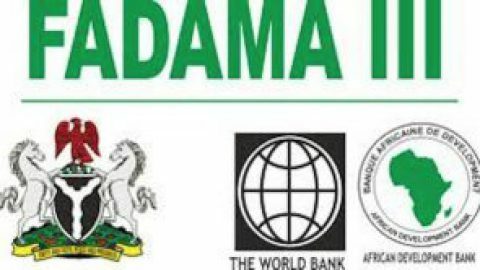 For the University of Aberdeen, the proposed collaboration in the areas of student and staff exchanges, would involve the possibility of utilising the first two years in FUNAAB and the remaining two years in Aberdeen, while carrying out joint research visits and grant application. 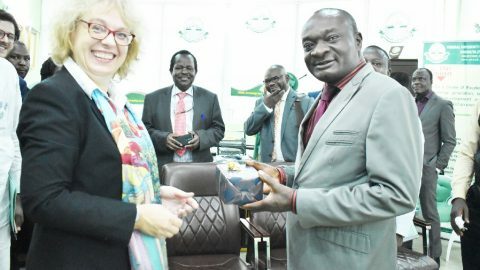 The Dean, Sub-saharan Africa Affairs of the University of Aberdeen, Dr. Alfred Akinsanya, said the University was established in 1495 and that graduates of the University had won Nobel Prizes in Chemistry, Medicine, Physics and Peace. According to him, the University had over 16,000 students with 20 percent drawn from 120 nationalities worldwide. Dr. Akinsanya stated that the University had over 550 undergraduate and 120 Master’s degrees programmes, stating that it was one of the top 1 percent of the world’s leading Universities. He stated that, 85 percent of research outputs in its Engineering, were rated as ‘world leading’ and ‘internationally excellent’. Responding, the Vice-Chancellor of FUNAAB, Professor Olusola Oyewole, who was represented by the Deputy Vice-Chancellor, Development, Professor Felix Salako, stated that FUNAAB would follow-up on the areas of interest, which could open up more opportunities with the University of Aberdeen, saying “our students are eager to have this kind of experience”. 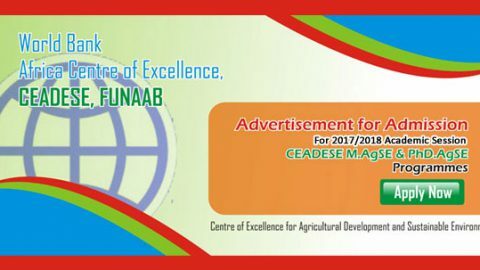 Also speaking, the Director of Academic Planning, Professor Olukayode Akinyemi, requested for a rebate in the fees, on behalf of the intending students, noting that international accreditation for FUNAAB’s Centre of Excellence in Agricultural Development and Sustainable Environment (CEADESE), programmes was very important and so the collaboration was necessary. 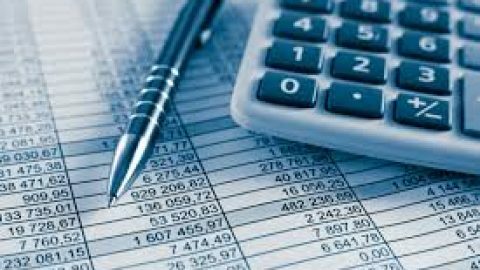 For the Marshall University, a Professor of Statistics in the Department of Mathematics of the institution, Alfred Akinsete has met with the Management of the University to work out the possible linkage. 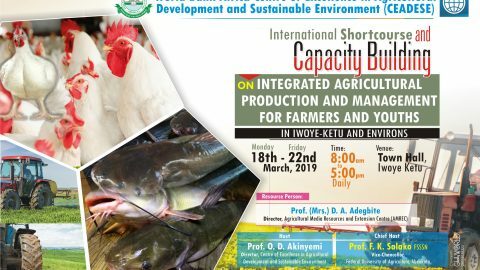 Professor Akinsete, who was a former staff of FUNAAB before he relocated to the United States of America about 20 years ago, said the linkage would be mainly in the area of manpower development. According to him, he had been interacting with the University on a personal basis for quite some time and had been able to recruit students from FUNAAB into the Marshall University Graduate Programmes who had graduated, while others were still pursuing their postgraduate programmes. He added that he could only do only little through his personal efforts, hence the need to follow up with the University Management to expand the linkage between Marshall University and FUNAAB. 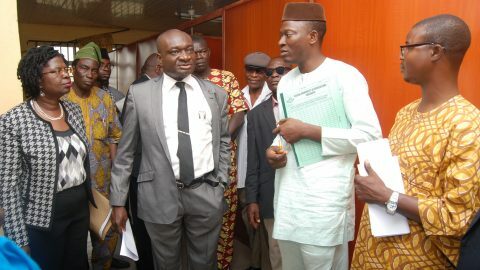 The primary collaboration involves the students, but there is an extension to that being that academic staff, who are undergoing their Ph.D programmes may also want to apply to Marshall University for a period of six months or one year to be supervised by an academic staff in the Department of Mathematics in our University, but the persons would have to come back to FUNAAB to complete their Ph.D programmes. 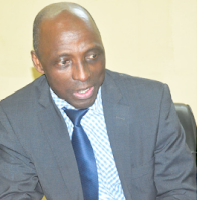 The linkage therefore involves students and academic staff who have not had their Ph.D programmes or are undergoing Ph.D programmes either in FUNAAB or any University but who are members of staff of FUNAAB”, he added. 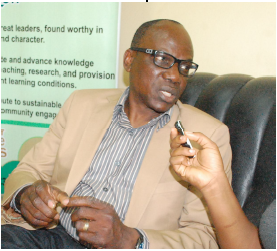 Professor Akinsete said the component for the undergraduate students was called the ‘2 + 2 Articulation Agreement’. In this component, he said “undergraduate students would do their first two years at FUNAAB and then they would come to the Marshall University to spend their remaining two years”. He, however, said that how the degree certificate would be issued and would incorporate FUNAAB would still have to be worked out. Another component in the graduate programme, the University Don said, was one in which students would spend their time with the Marshall University for a period of two years utilising the Tertiary Education Trust Fund (TETFund). Professor Akinsete further said, “there is one success story where a gentleman from here, a student who finished from the Department of Mathematics, his name is Olusegun Otunuga. What I did was to tell my colleagues from the Department of Mathematical Sciences in FUNAAB for them to introduce to me their best student and they did in 2009. The student came over and we gave the student admission and also Assistantship because then, I was the Director of Graduate Programmes. So, he came to my University, got is Master’s, pursued his Ph.D programme at the University of Western Florida and now, he is teaching in my Department. We just employed him back to my Department. So, there is that possibility. However, it is not automatic, the reason being, that why the gentleman was able to get a position is that there was a vacant position he applied for, it was not because I was the Director, he applied for the position and got it by merit”. Professor Akinsete, who described his visit to the Univeristy as ‘home coming’ because he had spent about 20 years in FUNAAB before leaving, noted that he was highly impressed with the developmental changes that he saw and was quite elated that, “FUNAAB is a success story with many expansions and buildings and fortunately, the two students that came to my Department at the Marshall University also laid down a very good foundation. They were the best in their classes. They had 40 out of 4.0 Grade Point Average (GPA) at two different times. So telling my Department that I want a possible linkage between FUNAAB and Marshall University, was not a difficult thing to do because they have interacted with students from here and they know that they are of very good stuff and I hope that the students that will come to my University after this, will be the same quality of students that we have had before”. 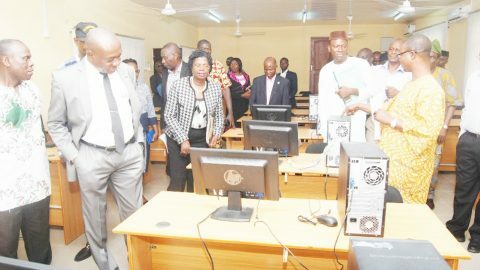 Professor Akinsete disclosed that when he was in FUNAAB, he was the Head of Department, Mathematical Sciences for about seven years combined and was also at one time the Director, Computer Centre and was responsible for managing the e-mail facilities at the inception of e-mails for many years in the University before he finally left the University.